HIGH-QUALITY CONSTRUCTION. Ultra-soft and breathable, these pillows are made using a down alternative filling to provide optimal comfort and long-lasting strength. As a result, you will feel well rested each and every day for years to come. GET A GOOD NIGHT’S REST. Cushioning your head and neck with gentle support, these pillows will make you feel like you are sleeping on cloud nine. Get a good, restful sleep night after night so you can wake up feeling refreshed and well-rested to start your day each morning. BREATHABLE MATERIAL. To keep your temperature regulated throughout the night, these pillows are made using breathable materials to allow for air circulation. As a result, you will have optimal comfort on cold, winter days and hot, sticky nights. 4-PACK SET. For added convenience, these pillows are sold in a 4-pack set to supply you with a sufficient amount. They’re available in king and standard/queen sizes to accommodate everyone’s needs. HYPOALLERGENIC MATERIAL. 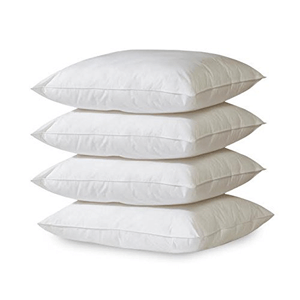 These Millenium Linen Pillows are hypoallergenic to ensure it doesn’t irritate allergies. Resting your head on the breathable, soft material, you can sleep easier and have sweet dreams every night.